You can imagine the marketing meeting. 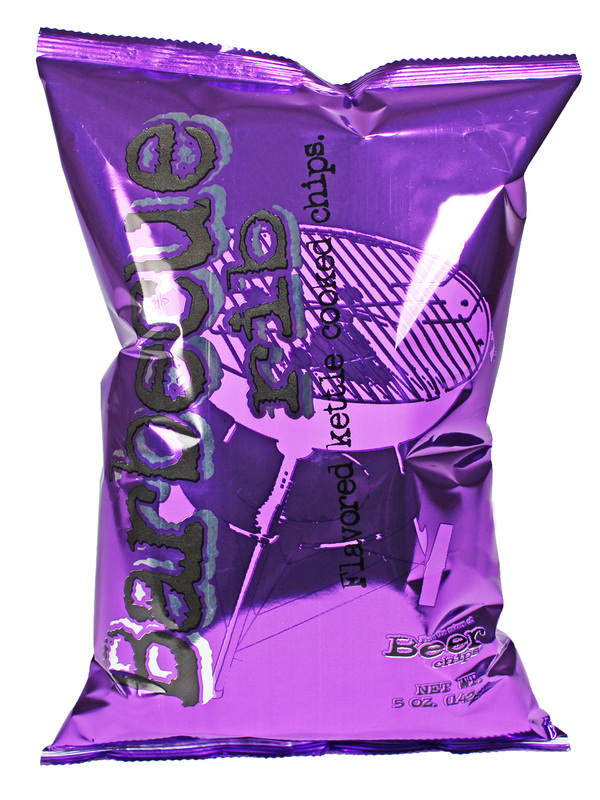 A quandary - Buffalo Wing has snagged the dark red color bag, so what to do with Barbecue Rib? Fortunately the right outcome emerged: A bright and brassy colour that doesn't relate at all. The only problem with this design (and we love the Kettle Barbecue image in the background, by the way), is the uniform black writing used on their bags is a too dark to read. It should be white or silver. Some of the Chips were hard, especially the smaller ones, which made for a 'break' rather than a crunch. The Kettle Cooked nature of the Chips meant some were soft in areas. These Kettle Cooked Chips are a little on the greasy side and many of the bag's constituents were folded or small and curly. There was a residue powder, which was nice, but they seemed a bit over oily. In some respects these could be considered the ideal Barbecue Chip. The flavors were good; not too salty, no dominant flavors, but somehow this nice taste, became just that, 'nice'. So overall, a decent Barbecue Chip, and it could be unfair to say they were average, but because there was no dominant flavor there wasn't much to say about it.